Let me ask ya… if you were going to steal a car, would it be a generic blue or tan Honda Accord, one of those stupid, bronze Lexus SUV’s OR would it be a one-of-a-kind kind of vehicle? If you guessed the Honda which it seems every 3rd person in this world has, or one of those bronze Lexus SUV’s which seems like 1-in-3 people who have some extra scratch owns, you might make a smart ALLEGED criminal. 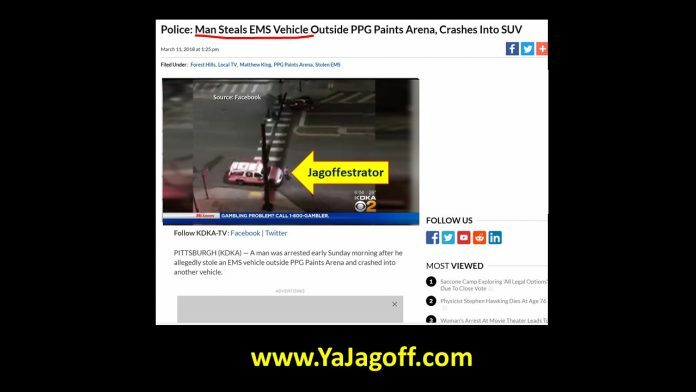 However, our man Matt King, ALLEGEDLY, stole a City of Pittsburgh EMS SUV, that was parked outside of the PPG Paint Can responding to an emergency, and subsequently wrecked the thing only a few blocks away in the Hill District. See full story and the Yinzer-Narrated video on KDKA-TV here . Hey there “Matt King Cool” (Oh my! I slid THAT one in on ya!) looks like you had an “unforgettable” night! (Oh my! I slid THAT one in there too!) My man, if you’re gonna steal a car… heisting a one-of-a-kind-highly-decaled-lights-flashing-built-in-emergency-radio-and-gps-devices-and-computers vehicle in the middle of an exiting Pens crowd with Mike Lange-type yinzers in their hey-look-at-us-dahntahn-without-the-kids-date-night suite recording and narrating yer antics on their smart phone… is NOT the recommended method! Annnnnndd, the NEXT time ya try this, you may also wanna pick an accomplice that knows how to drive so you can get more than a few blocks away. Have fun roasting your chestnuts on an county jail open fire (Oh my! Kinda got ya there!) …Ya Jagoff!